Welcome to this week’s Better Know a Young Millionaire series. Over the last few months, I’ve been sitting down with young millionaires (under 35) to share with you their successes and failures, and what they’re doing with their money right now. The goal is to look at what it takes to be successful, to give you motivation, to talk with people “who’ve been there,” and to find out what they’re doing right now in this economic environment. I love sitting down with these individuals and listening to what they have to say! This week, I have the pleasure of chatting with Alan Corey. 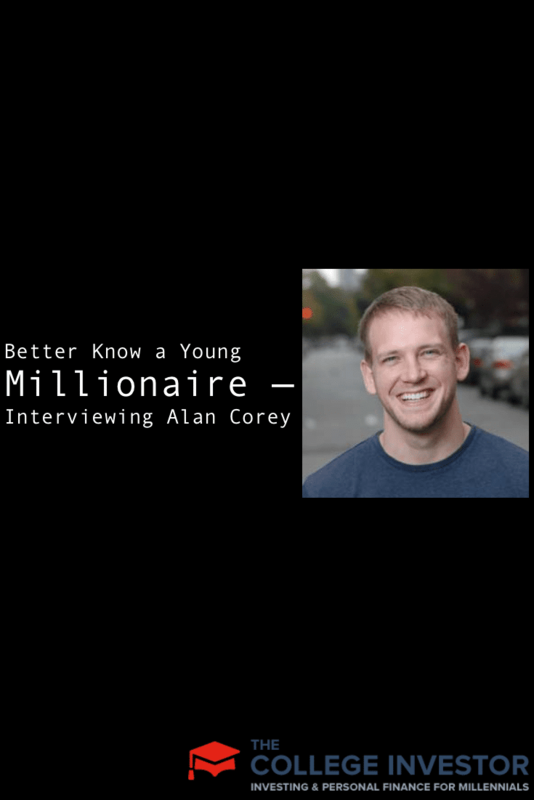 Alan Corey is the author of the book A Million Bucks by 30 and The Subversive Job Search. Alan has a story that most of us aspire to — leaving his parents’ house at 22, with a focus on making it to $1,000,000 by 30. The awesome thing is that he found success — through strategic investing and frugal living, and he reached his goal by 28 years old. Not only that — he’s funny! So, let’s sit down with Alan and get to know him a little better . . . .
First thing, how would you describe yourself and what you do? Alan: I’ve got my fingers in a lot of things. I’m a career and personal finance author, I’m a real estate investor, and I’m also a software project manager. Alan: As documented in my first book A Million Bucks by 30, I had an entry-level job paying $40,000 a year in New York City. I set a goal for myself at the age of 22 that I would buy one property a year for investment purposes. I adopted an extremely frugal lifestyle to be able to afford achieving this goal and in a matter of time, I had a small collection of properties generating an excellent amount of passive income. Throughout this, I kept my day job in software and I still have a day job to this day. All my investing happens in my free time and is something I have found time to always do on the side. That’s amazing that you’re still working your same day job! Many would argue the economy is still sluggish — how did you manage to find a job during the last downturn? Alan: My follow-up book The Subversive Job Search details how I lost my first million, became unemployed, and then made my million back by quickly climbing the corporate ladder. Being lost in a sea of resumes, I found a way to distinguish myself and get noticed by recruiters, hiring managers, and human resource professionals. It was a combination of correctly branding my corporate skill set, leveraging online and social networks, and being open to honest feedback from all sources. In due time, I became incessantly headhunted and then job offers started coming in to me, which makes any job search much easier. And it allowed me to more than quadruple my salary in less than two years. What’s your biggest tip for college grads looking for a job right now? Alan: Most college grads lack experience, and I’d recommend they start working online via websites oDesk and Elance as early as possible. They won’t make a ton of money doing this, but they shouldn’t do it for big paydays, they should do it to gain real-world corporate experience. They’ll learn what they enjoy working on, what they are good at, and they’ll have actual workplace fodder to talk about in their future job interviews. Doing this step also shows they are self-starters and motivated, which goes a long way in making a positive first impression with any hiring manager. Editor’s Note: It appears oDesk and Elance are now combined into a new brand, Upwork. How are you investing your money right now? Any fears about the economy right now? Alan: I’m still investing in real estate. With interest rates still historically low, I find it’s an excellent time to invest in some rental properties. As long the rental income covers all expenses, then things usually work themselves out in the long run. I have no control over the economy, so I don’t let it be the only reason to do or not do something. If I did that, I’d constantly be waiting for things to get better and never get around to investing. Also, real estate is my first love, so I’ll also find a way to invest in it. My strategies have changed from short-term flips to long-term rentals, as they are slightly less riskier. I’ve also just started a Prosper.com account, which allows me to invest in individuals. Returns are roughly 7-10%, depending on the risk you are willing to take, and so far I’ve had great results. It definitely beats keeping money in a savings account just to earn a pittance and something I’d recommend others to at least explore as an investment option. You talk a lot about penny-pinching. Is that a requirement, or is it relative to your income? Alan: That is relative to income. I’m not the penny pincher I used to be because it is no longer a necessity for me. When I was making $40,000 a year, I needed every penny to my name in order to make a down payment on a house. Thankfully, I’m making more now and my other investments have done well so I don’t have to be so budget-conscious. But I still do love a bargain! Alan: Biggest risk is probably buying a bar and restaurant without knowing anything about the business. It had always been a dream of mine, and well, it turned into a nightmare quickly. In the long run, I sold it two years later and basically broke even on the venture, and I count my lucky stars it wasn’t worse financially for me. If you could make one change, what would it be and why? Alan: No changes, as I feel like every negative thing is a lesson learned. I’ve found a positive mindset gets you over most obstacles, and there are always obstacles in wealth generation, whether that is buying an investment property or trying to create a six-figure career. Alan: Many people are dismissive of success and contribute others’ wealth to blind luck. Indeed luck can play a part, but how can you get lucky in real estate if you don’t own a house? How can you get lucky in stocks if you don’t know what makes a good stock pick? How can you have the next billion-dollar start-up if you don’t build anything? I think learning that hard work pays off in more ways than one is important. With hard work comes experience, with experience comes opportunities, and with opportunities comes luck. And with all of these four things working for you, then comes wealth. I love Alan’s story because it’s one of success, followed by failure, followed by success. Alan is one of those guys that gets right back on the horse when he falls off, which is inspiring. So many people have their businesses fail (like Alan’s bar), and then fail for the rest of their lives . . . it’s sad. I’m so glad to see Alan succeed. What I also love about Alan’s story is that he is successful by building multiple income streams — he still maintains his day job! That’s amazing! Beyond the day job, he has his investments, and then he has a passive income stream from the time he put into writing his books. That is a huge motivator for me, and shows that it can be done on any level! Thanks Alan for sharing your story with us! 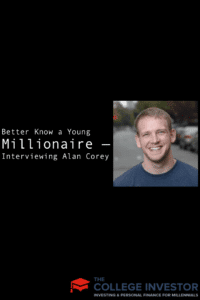 If you want to learn more about Alan, you can check out his website at www.AlanCorey.com or follow him on Twitter @AlanCorey. What are your thoughts on building multiple income streams? Do you have what it takes to balance it all like Alan? Great stuff! One of the things I like about this guy is there seems to be no fear of failure… I think that is a key to finding success. I can relate although I did it later on the West coast. I bought income property and then diversified into businesses. It worked out very well, I achieve d financial freedom in my late thirties. Wow! Alan is a really inspiring guy. I wish I can do some of the things he has done after I graduate college. Thank you for doing that interview Robert! I love the thought of building multiple income streams, particularly passive income so that I can enjoy life. This is very inspiring!